Giant Fractal Jelly Fish feature in the new public areas designed by Tony Owen for one of Sydney’s premier addresses. Tony Owen Partners have just completed the transformation of the Darling Island public areas. Darling Island Apartments, originally completed in 2004, is one of the most prestigious developments in Sydney in recent years. Located on a virtual island at the western side of Darling Harbour, it has spectacular Sydney city views and absolute water frontage. The large apartments are luxuriously and environmentally designed. However, it was always agreed that the lobbies and public areas were not up to the standard of the rest of the development. They were bare and ordinary with no sense of luxury or style at all. The lobbies all have stunning harbour views, so it was a missed opportunity to do something spectacular. As a blank canvas, this was a great opportunity. Tony Owen was part of the original team that designed the project for PTW, so this was a chance to come back and complete the project. The brief was to create entry spaces with a sense of exclusivity that reached the standard of the rest of the development. At the same time the design had to be efficient. Whilst the body corporate had accumulated a decent sinking fund, the budget was still very tight and we had to be creative. We used luxurious materials such as stone, bronze mirror and unique Italian geometric tiles to create the feel of an exclusive boutique or hotel. The design also had to be iconic so people would say ‘Wow’ when they walked in. 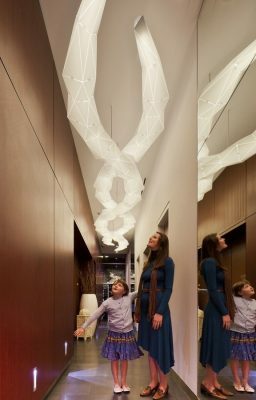 We designed special 5m long fractal light sculptures as the feature element for each lobby – a sort of a 21st century jelly fish. At night these jelly-fish glow and are a beacon for the project. We used rhino scripting to generate the geometry which became the template for the manufacturing process. The lights were built by Yellow Goat who specialize in unique lighting installations. We also used laser cut screens to mark the entries of each lobby in a unique way. The design was created by artist Gary Dermeidjian and is based on the maritime artifacts found at the site. So they also contribute to the public art for the development. The project was constructed by Join Constructions.